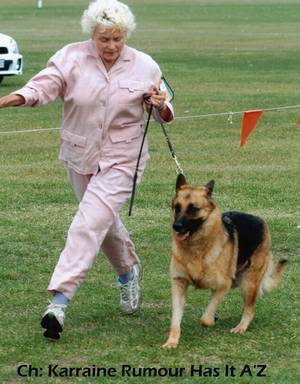 Karraine Kennels was established in 1960 when Pat purchased her first Shepherd whilst in high school. 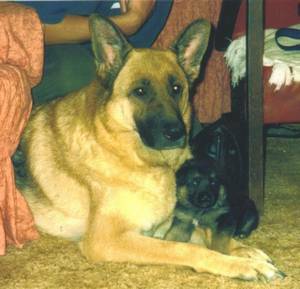 This was closely followed by a second, and in 1964 the first Karraine litter was born. Pat's involvement with the breed continued throughout her University and teaching careers. By the 1970's some 19 adults were living with Pat and her mum. Most of which had both their Aust Ch. title and at least a CD title as well. Pat was actively involved in bringing in imports in the late 70's, whilst waiting for 3 from Europe, 3 were imported from New Zealand. These 6 formed the nucleas of our now well established kennel. In June 1976 whilst on 3 months honeymoon in Europe, with husband Kevin, we purchased our beautiful boy Ch: Lynlee Dominingo - a Hein von Konlgsbruch son; who was to become the sireof our magnificent Kommodore, Kialoa and Klassic. Karraine Kiola was the first ever Shepherd to be breed surveyed in Tasmania going class one under Louis Donald; and she accounted for 12 Best in Show's and B.I.S.S awards whilst her litter brother Kommodore also class 1, accounted for dog of the year, 4 consecutive years, with a Runner up Dog of the year either side of these 4. Winner of some 44 Best in Show awards from limited exhibition due to Pats teaching career. 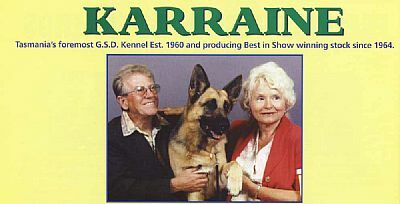 We, Kevin and Pat, at Karraine have accounted for some 153 Best in Show and Best in Show Specialist awards throughout Australia - whenever possible, taking our stock to compete interstate. We are great supporters of the GSD Breed Improvement schemes with all our breeding stock, being Hip & Elbow X-Rayed and we are the proud recipients of National Councils Bronze, Silver and Gold Medallions for their hip schemes. At Karraine we place great emphasis on temperament - most of our dogs live as family pets doing what they do best - providing loyal, lovable protection and companionship.